This soup is hands down my favourite soup there is, which is why I couldn’t resist putting it in my book! 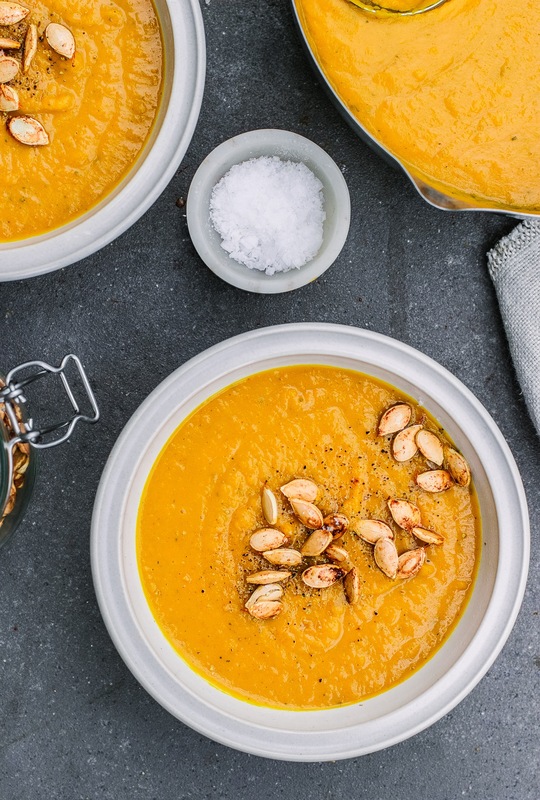 Pumpkin makes the smoothest, creamiest soup and it tastes like autumn in a bowl, all those delicious and warming flavours that give us a reason to look forward to this time of year. There’s no better dinner to come in out of the cold to and this comforting soup will leave you feeling warm and cosy. Scoop out, peel and chop your pumpkin and squash into cubes. This is a bit tedious so if you’re short on time buy it already prepared. Lay the cubes out in a roasting tin, drizzle with about a tablespoon of olive oil and a sprinkle of coarse salt. Add the three garlic cloves (still in their skins) and toss it all around. Roast at 200’C for about 30 minutes until soft. About 25 minutes in, put a large pot on medium heat and add about two tablespoons of olive oil. Sprinkle in the spices and let them sizzle for a minute or two. Dice the onion and add it to the pot, letting it sweat for a few minutes, stirring regularly until they’ve gone translucent and soft. Pour in your stock. Take the roasted pumpkin and squash out of the oven, squeeze the garlic cloves out of their skins and add everything to the pot. Let it simmer away for about ten minutes. Add everything to your blender, either in batches or all at once depending on the size of your blender and blitz until smooth and creamy. Add it all back to the pot and let it simmer while you toast the pumpkin seeds. Add them to a pan on medium/high heat and toast them for a few minutes until they’re nice and plump. 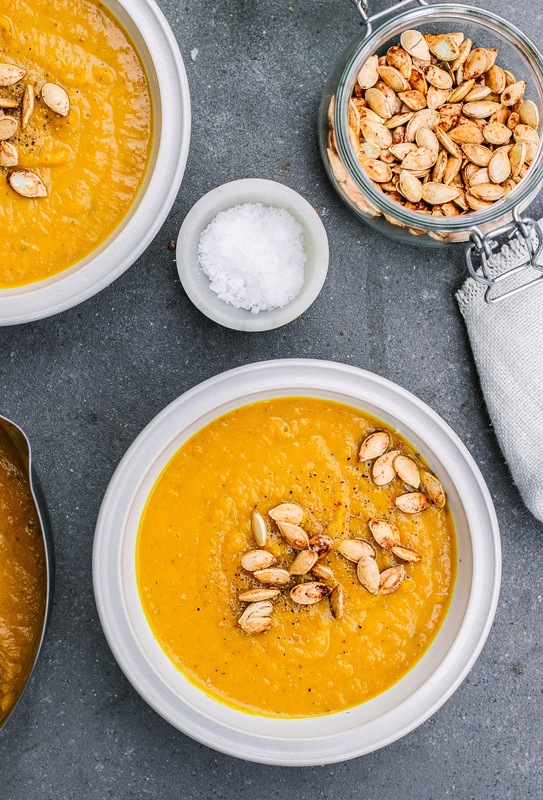 Serve with salt and pepper, a sprinkling of pumpkin seeds and a drizzle of olive oil. Sounds great! Can you make it with the standard carving pumpkins in the shops at the moment? Can you do anything with the pumpkins you carve,,,? Can you cook them?